FANBOY PLANET.com . 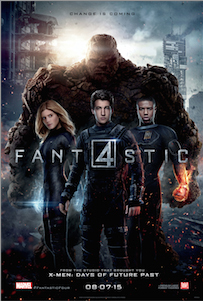 : Fantastic-Four-Trailer :. We just finished Comic-Con. From Fox, trailers leaked for Deadpool and X-Men: Apocalypse. There was buzz about a selfie with all the X-Men, including Ryan Reynolds as Deadpool and Channing Tatum as Gambit. But for Fantastic Four? Nothing. We heard nothing. Then last night came the news that the movie will not be converted to 3D, which, actually, I'd rather they not anyway, but it's still interesting. What are we not seeing? What are we not hearing? Well, check out the trailer for yourselves.